Fire early Sunday morning gutted a section of a building on Cummings Street, just off Regent Street. The building is owned by former Guyana Defence Force officer, Oliver Hinckson. While the blaze was brought under control and confined to that building, smoke was still billowing. 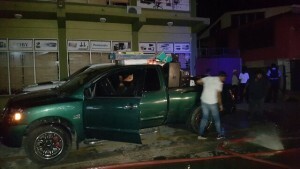 ‘A’ Division Commander, Assistant Commissioner Clifton Hicken said police arrived on the scene four minutes after receiving a call from the fire service. Lawmen pursued a man clad in black and hooded who was seen running away from the building. A neighbour said the fire started in Ram’s Drug Store. Fire fighters were up to midnight cutting open the metal door to one of the stores on the lower flat. Business owners later arrived on the scene with vehicles and carried away a large number of items from the premises. Heavily armed police have since cordoned off the block to keep back curious onlookers. The building once housed the headquarters of Roraima Airways in its early days. About 10 years ago, efforts had been made to burn that building. A bucket with a flammable substance had been found there and the carpet was soaked.